I'm so excited to talk about this little precious Galago Pro! 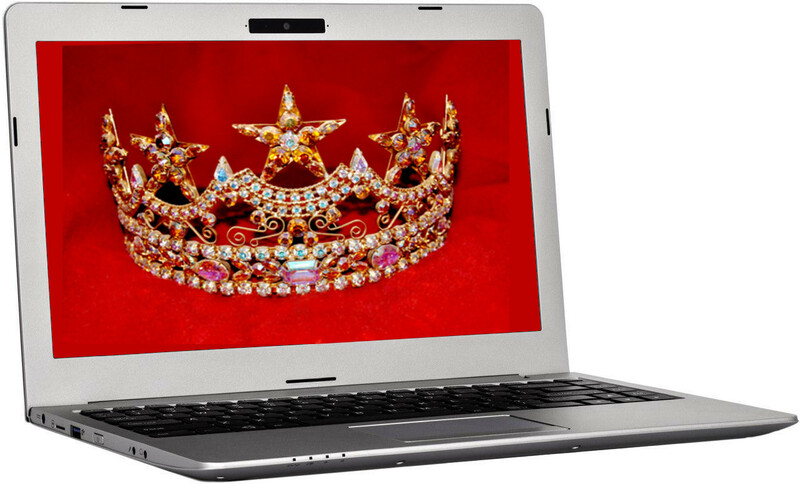 I like to name my laptops, and nothing is more fitting for this machine (in my use case) than the name ‘Princess’ because my experience with the Galago so far has been royally spectacular. After more than a month of frequent use, I’ve found the Galago to be an excellent choice for the mobile worker. I’m frequently on a train, plane or bus, so portability is an absolute must-have for me. Although the portability is my favorite feature, I’m fond of a few other things the Galago Pro has to offer. She’s so pretty and shiny with her smooth aluminum body. She sports a touch of class with the metallic accents bordering the touchpad adding the perfect amount of elegance to remind you what you’re working on just before you start typing. I feel 'elite' just working on the Galago Pro, knowing that whoever is on the other side of the display is envious of my prized gem of a laptop. Princess caters to what I need in a keyboard. I can type 80 wpm which is my normal average, with few mistakes- if any. I love that there’s no numpad on the right because I’m not trying to use this for massive spreadsheets or calculations, so that space isn’t filled with unnecessary keys. Instead, it makes my little Precious even more portable. Love the Home and End keys on the side of the Enter key. Just a pinky distance away. Fabulous! The size is perfect. This is my second trip with the Galago Pro. I couldn’t pick a better travelling partner! She’s .56” thick with a 13” display and 2.87 lbs. On the flight, the Galago positions perfectly on the tray table. Since it’s so thin and light, I didn’t have to bring anything but my laptop bag for this trip. I had plenty of room for clothes, my curling iron, makeup bag and hygeine bag. I’m pretty psyched to slim my trips down to one laptop bag! I’m used to carrying my 17” laptop which I thought was pretty portable for a 17”, but I don’t think I’ll even be taking the bigger one out of the house anymore since the Galago is much more portable. Another great feature- the power adapter is tiny! It’s .2 lbs and 3.5”x 1” x.75”. Slimming down to the more portable Galago Pro for my trips leaves room for an entire other outfit! Guess what? If you have your own hard drive or RAM, or just can’t afford to max out your Galago Pro when you purchase, you can add your components down the road. 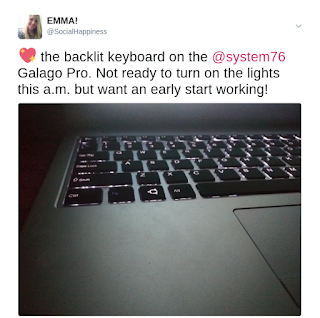 I took Princess apart to show you how wonderfully easy and quick the Galago Pro is to service. Check out below. My workload while travelling consists of writing with Libre Office, web browsing (lots of Tweeting!) in Firefox with multiple tabs and responding to System76 customers in Chrome. I also enjoy some video action on Netflix and YouTube. I got a solid 4 hours of battery life consistently off a full charge, with multiple suspend sessions in between. My first flight was 3.5 hours. I was able to comfortably work on the Airplane tray table the entire flight, minus the mandatory tray tables up and airplane mode sessions. For me, the battery life is perfect as frequent flyer. 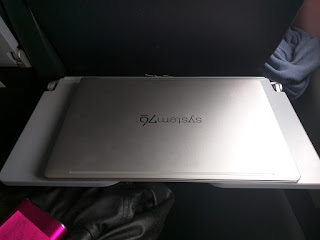 It’s rare that I even work on the laptop for an entire flight, so the battery life is actually more than enough for a trip, especially when you factor in the usual in-flight beverage, snack and bathroom break. Being able to suspend properly by just closing the lid is extremely convenient. With as many times as I have to stop doing what I’m doing quickly, I love to be able to just pick up right where I left off just as quick as it was to close the lid. With that said, you’ll likely get 3.5-4 hours with the 36 Wh battery on the System76 Galago Pro. Have a fab day in the freedom land of open-source!